The Farquhar College of Arts and Sciences welcomed celebrated writer Jamaica Kincaid as the first guest of the college's 2012-2013 Distinguished Speakers Series. The Caribbean writer and novelist was the keynote speaker at Nova Southeastern University's 2012 Convocation ceremony, an annual gathering of the campus community to mark the beginning of the undergraduate academic year. Writer, novelist, and professor Jamaica Kincaid's literary voice is deeply rooted in her experiences as a child in her native Antigua. Growing up under the colonial rule of England instilled in her a unique perspective. Her writing can be described as a melodic blend of poetry and prose, and this distinctive style has appealed to audiences across generations and ethnic boundaries. In 1976, Kincaid, known for her candid and emotionally honest writing, attracted the attention of The New Yorker, where she became a staff writer and featured columnist for nine years. Her first book, At the Bottom of the River (1983), won the Morton Dauwen Zabel Award from the American Academy and Institute of Arts. Her award-winning book, A Small Place, about the impact globalization can have on a developing country, inspired the 2001 documentary film Life and Debt. Her 2005 book, Among Flowers: A Walk in the Himalayas, chronicles her adventure into the mountains of Nepal with a group of botanists. Kincaid's other works include "Girl," Lucy, and the college's First-Year Reading 2012 selection-Annie John. 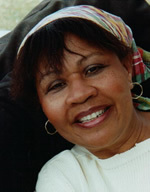 Kincaid began her academic career in 1991 at Harvard University, holding joint appointments in the English and African-American Studies departments. Now a professor of literature at Claremont McKenna College, she was elected to the American Academy of Arts and Letters in 2004 and the American Academy of Arts and Sciences in 2009. She is the 2010 recipient of the Clifton Fadiman Medal. As part of the college mission to prepare students for rich professional careers and active citizenship, the college frames co-curricular programs and experiences around a broad annual theme that unites our community in interdisciplinary exploration. The academic theme for the 2012-2013 school year is "Life and Death." Kincaid was the first of the distinguished speakers for the year to address this theme.